Magento is probably the most powerful shopping cart currently available on the eCommerce market. In addition, it offers a free access to the core files and developers can add new features due to their needs. At the same time, this procedure requires the high level of technical skills. So, let’s take a deeper look at the process of adding a new feature to Magento. Below you will find out the path of creating a Time Dependent Shopping Cart Rules Extension for this shopping cart. What Time Dependent Shopping cart Rules Mean? When you start a promo campaign on your store, it is likely to get as much from the shopping cart as possible. 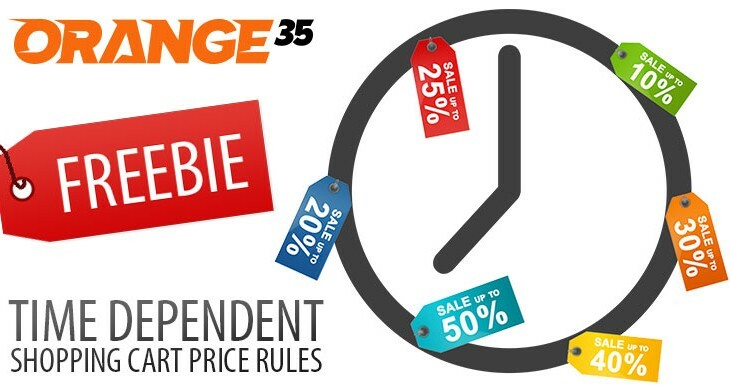 Out-of-box, Magento provides store owners with a limited functionality regarding price rules. You can set only the Start and End Date, but have no permission to configure the exact time. So, Orange 35 Developers Team decided to change this situation. So, after a laborious inspection of Magento core files, the solution was found. Today, it is available as a Free Magento Extension from Orange35 Store and Magento Connect. You can simply install it and benefit from new features. But, in this article, the development process is described step-by-step. So, keep reading to find out what was done before the release. First of all, we are going to override some of the Magento core models and controllers. To do so, we will basically need to create an extension. So please see some basic steps of creating an extension. Now we are going to go to the database and check where Magento saves shopping cart price rules. It is ‘salesrule’ table. And as you probably noticed, “from_date” and “to_date” columns have the “DATE” type. Although, executing it every time on every site could be a problem, so let’s just make our extension do it by itself on installation and save us much time. Highlighted are changes related to time format. But there is another code important to make everything work and keep the default functionality. Our goal is to let Magento know the current time when it is validating the dates. To override this function we will need to update our config.xml file with these lines under <models> tag. All we need to do is to replace $this->_filterDates to $this->_filterDateTime. After that, you will be able to set an exact Start and End time for your Magento Shopping Cart Price Rules in the DateTime format. Rememmber, that you can get this extension for Free from Magento Connect or Orange35 Extensions Store right now. Hope this article was helpful, but if you wish to add something, leave it in the comments below. one more thing, you need to update/change “$model->validateData”, because if we enter less time in to date for same date, it gets pass, but it shouldn’t. nice extention and work perfect on cart rules….But I´m missing only the feature in the catalog price rules. It will be perfect, when this feature is in the next version…. Unfortunately there’s no solution for catalog price rules yet as we didn’t have a chance to go over it. The catalog price rules system is actually a lot more complicated in terms of how items are being saved and updated. There’s a chance our team will investigate this in the future, but it is not scheduled at the moment.